For a successful stay we believe you need a friendly and comfortable environment and it is for this reason that we do our best to ensure it. We carefully select and regularly visit each accommodation. With most of them we’ve been working since the beginning. Standard, rooms are booked from the Sunday before the first course day until Saturday morning after the last day of lessons. 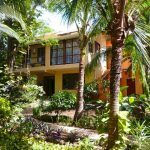 In Tamarindo you can choose to stay from Sunday to Sunday without extra costs. If you prefer this, please leave a message on the enrolment form. Other extra nights are subject to availability. The student residence is centrally located in Playa Tamarindo, only one block from the beach and from the school. The student residence amidst a tropical garden. The main floor is an open area with a large community kitchen, a comfortable living room and a spacious dining area, with a double door that leads into an outdoor sitting area, and a comfortable living room. The setting of the main floor invites the students to have activities such as preparing a dinner, play games together, do homework or share their day's experience with others. The patio is surrounded by large trees and a nice garden where students can relax in the hammocks or lounges for a shady retreat. WIFI is available. The bedrooms are assigned for women or for men and are to share. All the rooms have a closet and a fan and the showers have hot water. Breakfast is included. In case the residence is fully booked, we will provide alternative accommodation for the same price. The on-site student residence is right on the campus and is a newly build house with a spacious living room. All of the rooms have air conditioning. The rooms are all shared, some with 2 beds others with 3 beds. There’s Free wireless Internet access. Like in the other student houses, the on-site residence offers a fully equipped kitchen to the students. Students are welcome to bring their own notebook with them. All rooms in the student houses do have a security box where the notebooks and other valuable things can be placed. Breakfast is included. In case the residence is fully booked, we will offer lodging in the Student residence + or other alternative accommodation for the same price. The student residence + is located 2½ blocks from the school and 3½ blocks from the beach. This house offers all the luxuries and comforts of a home in a lush tropical garden. The house is modern, spacious, tastefully furnished and decorated. It has a fully equipped kitchen, a living room with a dining area and a lounge room on the second floor. Enjoy the outdoors with a cool drink under the small rancho, or a refreshing dip in the medium size pool. Breakfast is included. WIFI is available. Each sleeping room has two beds, a private bathroom, a closet and a dresser. They are naturally cooled by a ceiling fan and air conditioning. The bathrooms have showers with hot water. The rooms are to share unless otherwise arranged. In case the residence is fully booked, we will offer lodging in the Student residence, on-site or other alternative accommodation for the same price. Living with a Costa Rican host family is a great way to learn more about the culture while also having another place where you can practice your Spanish. We have carefully selected a number of families to help make your stay enjoyable. Typical families will host one to two students at a time. Each student will receive his/her own room and will get breakfast and one meal per day. Additionally each student will get a key to allow them to come and go as they please. The homestays can be considered relatively small and basic. However do not let this deter you. Costa Rican are well known for their hospitality. The vast majority of our host families are located in the towns of Santa Rose and Villa Real. These towns are approximately 3-5 miles (5-7 kilometres) from Playa Tamarindo. There is regular and cheap public transportation between these towns and Playa Tamarindo, so getting back and forth will not present any difficulty. Buses run from early in the morning to early evening. Taxis are available at virtually any hour. Bed sheets are available, but you should bring your own towels.